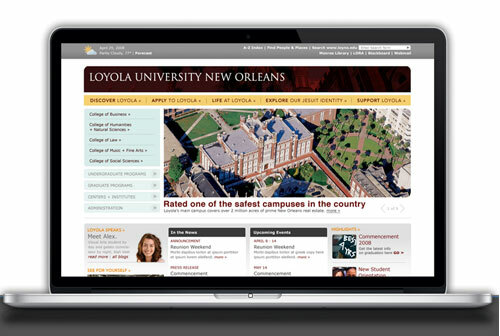 Since the initial launch in 2008, we’ve built over 150 separate Loyola websites using the new design and content management system (Drupal). 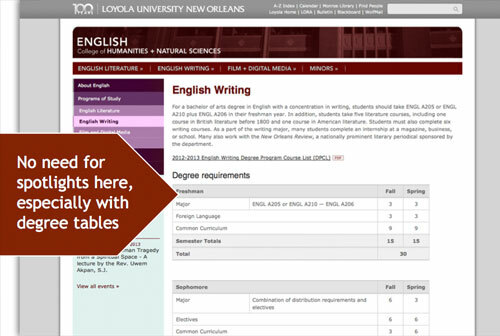 The university’s content editors influence the overall feel of Loyola’s website on a daily basis. They do so in three ways: visual cues, typography, and photography. 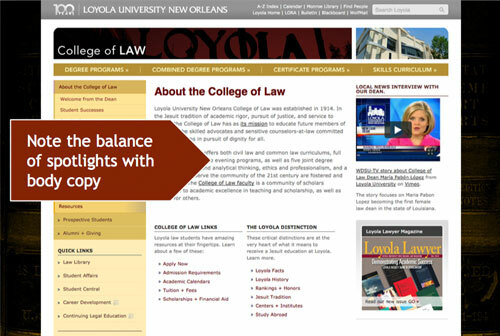 When I talk about our web editors’ impact on Loyola’s visual cues, I’m referring to navigation, spotlights, and page rhythm, all of which work together. 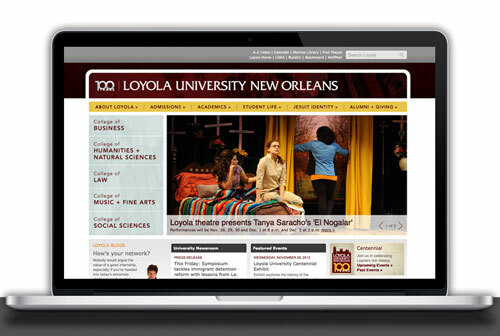 The cues we’re trying to give our web visitors is to read on, to keep exploring…and to reinforce the original goals of the design of the Loyola website: this is a progressive university with a unique story to tell, and the website is simply a facilitator in that storytelling. Note that this site has two small sets of navigation set close to one another, but that the coloring makes them visually distinct, and thus more approachable. But wait…remember what I said about how our visual cues work together? 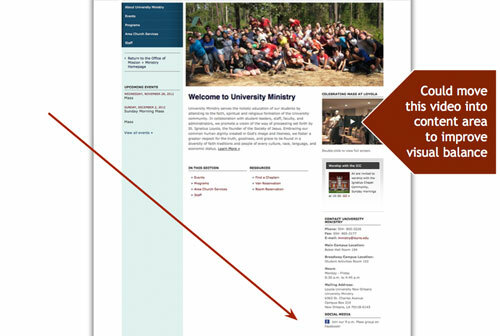 Notice the navigation on the left side of the page above, and how it scrolls down beyond the length of the content to the right of it. Think that’s a little overwhelming? You’re right! This is a good example of when to call on the web communications staff to discuss how we might trim down your navigation. 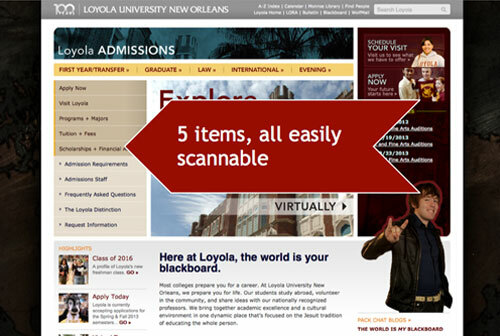 One of the most important elements of the design of the Loyola website is photography, as it can make or break the overall feel of a page–the old saying “a picture is worth a thousand words” isn’t an old saying for nothing! It’s also a design element that’s primarily curated by our wonderful campus web editors. I hope if you come away with anything from this post, it’s that Loyola’s “design” is not a concrete, unchangeable thing; it’s constantly evolving and being tweaked everyday by those who we are privileged to have editing our website. I read an article on UC’s rebrand recently where the author (a design professor) said, “design is a process, not a product.” This is one of the most succinct, accurate explanations of what good design is (and how it should work) that I’ve heard in recent times. 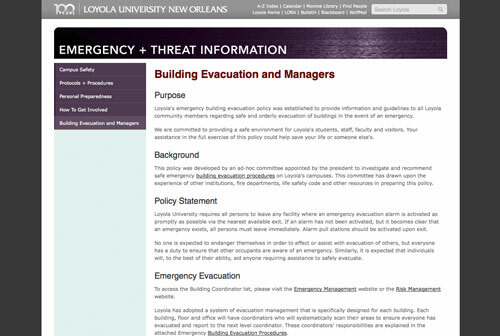 From typography to spotlights, to photography and page balance and beyond, our web editors are very much active participants in Loyola’s design process. Looking for the powerpoint? Download it here.